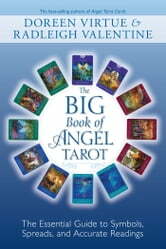 In The Big Book of Angel Tarot, best-selling authors Doreen Virtue and Radleigh Valentine follow up their groundbreaking work Angel Tarot Cards with the definitive guide to the mystical art of tarot. 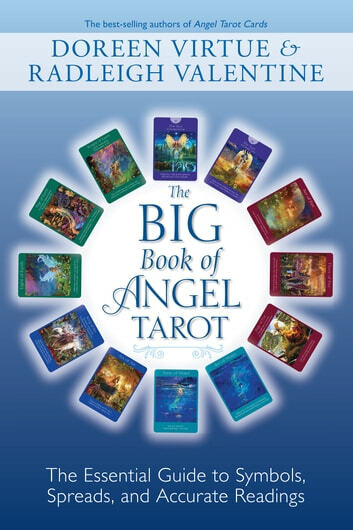 By removing the fear, worry, and secrecy from the process, Doreen and Radleigh are reintroducing the world to this language of the Divine, without diminishing any of the amazing accuracy and detailed information that tarot is known for. This fascinating book takes you card by card through the journey of The Dreamer in the Major Arcana, fully explaining all of the magical symbolism found throughout tarot. You’ll come to understand the importance of each suit of the Minor Arcana and its relevance to your daily life, as well as develop a firm grasp of the court cards by getting to know each and every one as if they’re real people. Doreen and Radleigh reveal the incredible insights into your questions and concerns that arise from various card spreads—and also teach you how to create your own!